Sorry folks, I just couldn’t resist. But yes, this is my review of Giant-Size Man-Thing #4 (cover date May 1975). In the Man-Thing chronology, this tale comes right after Man-Thing #16, which I reviewed in depth last time. That story featured the Man-Thing coming up against a decadent rock star and a murderously crazy old man dressed up like a Viking out in the swamp. Now Gerber follows that up with this, a story that features the Man-Thing taking on . . . some middle-aged parents and teachers? In a high school? Only Steve Gerber could do it. He’s probably the only writer bold enough to ever even try. Only Gerber; only in the pages of Man-Thing. DON: The Federal Trade Commission and Reader’s Digest have done you a favor. They’ve let you know that any ad that brings up the concept of health and cigarettes together, well, it just makes people think of cancer. LEE GARNER SENIOR (sarcastic): Yes, and we’re grateful to them. DON: But what Lee Junior said is right. If you can’t make health claims, neither can your competitors. LEE GARNER SENIOR: Great, so we got a lot of people not saying anything that sells cigarettes. DON: Not exactly. This is the greatest advertising opportunity since the invention of cereal. We have six identical companies with six identical products… We can say anything we want. Don writes on the board: “Lucky Strike – It’s ‘Toasted.’” The men all look at it, not sure how to react. LEE GARNER JUNIOR: But everybody else’s tobacco is toasted. DON: No. Everybody else’s tobacco is poisonous. Lucky Strike is toasted. …Usually, a limitation is a limitation. But occasionally a limitation can be an opportunity. It often depends on how you look at it—and on who’s doing the looking. 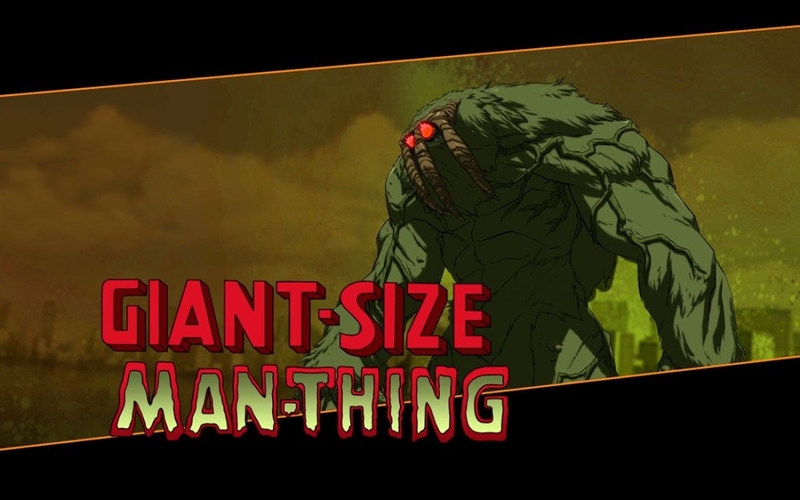 There are a whole lot of comic writers that would run screaming from the prospect of an assignment on Man-Thing. Because hey, what the heck are you going to do with him, right? He’s a swamp monster incapable of speech or even independent thought. Well Steve Gerber was not like a whole lot of other comic writers. Where other writers saw limitations, Gerbs saw infinite possibilities. Much like Don Draper with that cigarette campaign, Gerber realized that once Man-Thing’s limitations were established, the strip could be about literally anything and everything else. 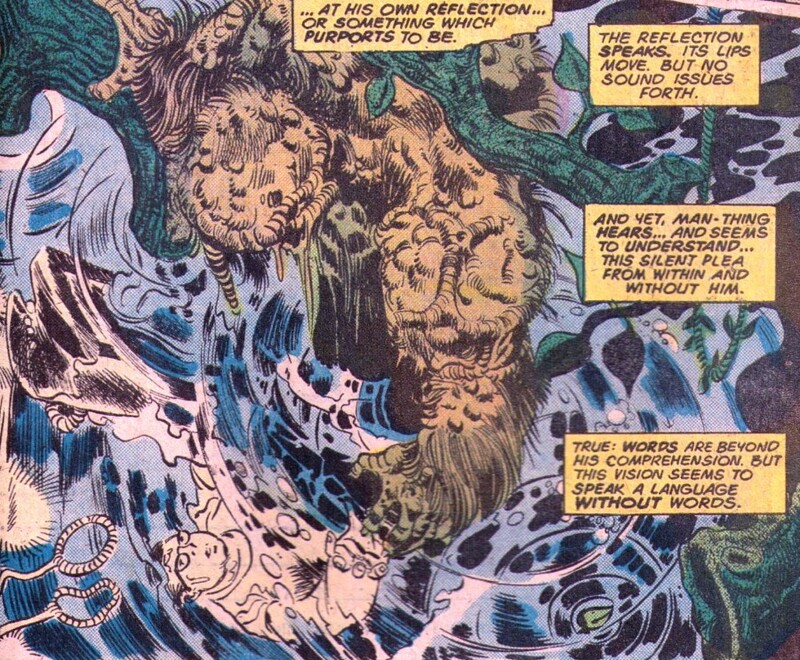 What the limitations of the Man-Thing actually presented was an opportunity; a challenge. All that was required was a writer with imagination—and imagination was one commodity Gerber possessed in great abundance. 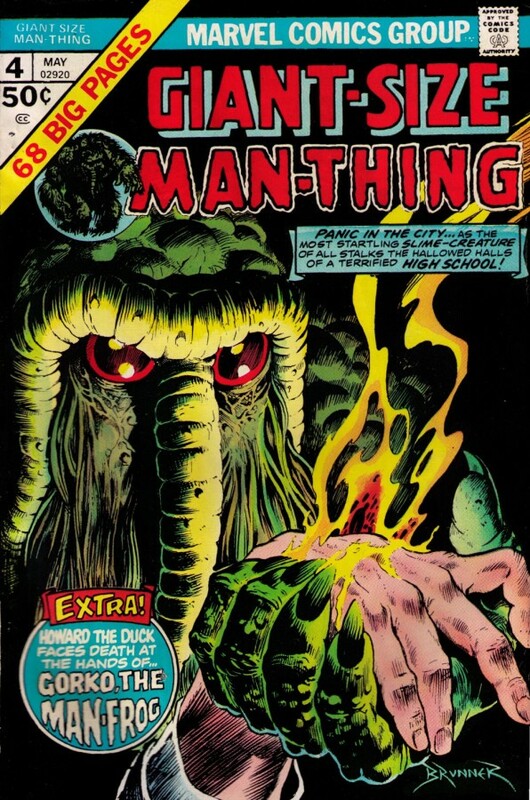 So one issue of Man-Thing might feature Manny facing off against Thog the Nether-Spawn, while the next might feature a suicidal circus clown. Or we could, as in this case, go from a madhouse allegory featuring an old man dressed up as a Viking straight into a tale of teenaged angst. Allow me to gush for a moment before moving on to your letters. Difficult as this story was to write, it presented an even greater challenge to its artists. Pencillers Ed Hannigan and Ron Wilson labored long and hard, often redrawing whole pages, until they were satisfied with the result. It’s to their credit they were never completely satisfied. Again, my gratitude for their dedication is virtually unlimited. Now it remains to be seen what you thought of our efforts. We know there are rough spots. But did we succeed at all? There’s only one way we’ll ever know. WRITE!! Please. We start out with a stock scene of Manny in the swamp. This time, instead of the usual alligator-wrestling fare, Man-Thing rescues a faun trapped beneath a fallen tree, which was a nice change of pace. At this point Edmond’s Uncle Sam gets up, punches Alice in the face, and violently throws her out. Then the Man-Thing shows up, drawn in by the cauldron of emotions. Naturally, Alice screams at the sight of him. This draws Uncle Sam back out and he winds up getting the burn treatment from the Man-Thing’s touch. Then the rest of the mourners come out and the force of their collective hatred causes the Man-Thing to retreat back into the swamp. We move on to Alice reading several pages from the diary to said committee. The diary’s contents are given to us via five text pages with spot illos. 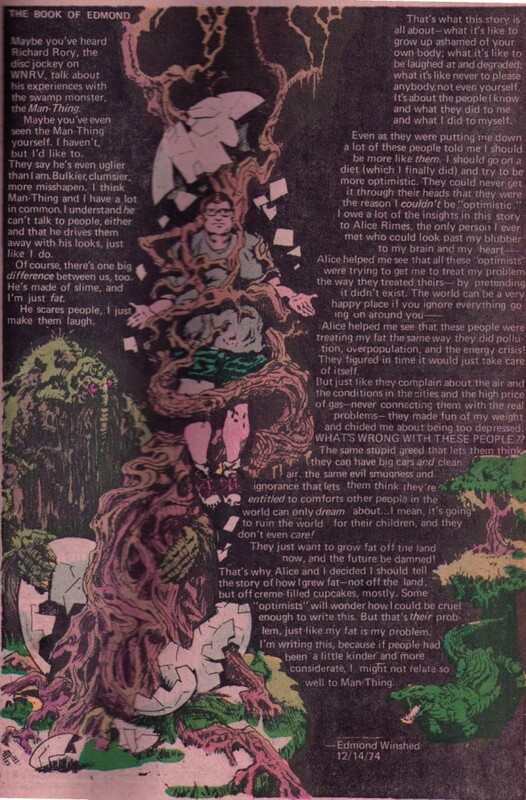 Now Gerber tried this text experiment several times during his original tenure at Marvel. Perhaps the most famous example was Howard the Duck #16, wherein the entire story was text with accompanying illustrations. This specific instance was not actually planned, but came about as a creative solution to one of those dread “deadline doom” problems that was so pervasive at Marvel in those days. A few of the more cynical readers thought this was a sneaky way for Gerber to get paid more money, but as Gerber pointed out in the letters page of HtD #21, he did not get paid by the word; he got paid by the page, regardless of how many words a page might contain. So he was actually doing more work for the same money. Gerber’s text pieces could be hit or miss. In this case, it was probably the best part of the story, but I’m not sure that’s saying very much. At any rate, the diary reveals that Edmond lived a rather unpleasant life, mostly due to the fact that he was fat and was often picked on for it. He remarks about how his fat body led him to identify with the Man-Thing and divulges that the worst abuse he suffered was at the hands of his own family and teachers. The final page of the diary, written by Alice after Edmond’s death, reveals that Edmond died as a result of Mr. Milner basically running him to death on the school track. Once Alice is finished reading, the classroom breaks down into heated arguing. They debate over whether they should run the piece in their magazine and also bicker over the series of events that led to Edmond’s death. While they fight, Alice silently walks out. After putting the diary in her locker, Alice is grabbed from behind and loses consciousness. She awakens in the school gym, held up (somehow) by her wrists in the gymnastic rings. All of the culprits are present: Mr. Milner, Edmond’s parents, his aunt, his uncle, and even his grandmother. They demand Alice turn over the diary. Out in the swamp, Man-Thing senses the emotions boiling over within the high school. He looks down at the water and we see Edmond Winshed reflected there. Manny then makes his way to the school and all hell breaks loose. He seals Aunt Elinore’s lips with his burning touch, breaks Uncle Sam’s back, then grafts Milner’s hands together in a position of prayer before dragging him outside. Sure enough, Milner is found dead at almost the exact spot where Edmond Winshed drew his last breath—his hands still fused in supplication and a big hole in his chest where the Man-Thing’s touch burned all the way through to his heart. The final panel shows Manny back in the swamp, staring into the waters again, and this time it appears to be Alice Rimes looking back at him. Back in the 70s and 80s, there was a lot of love and affection expressed for this story. And the first time I read it (circa 1990), I really enjoyed it too. But as time went on and I periodically revisited the story, I found myself liking it less and less.